How do I highlight the text related to my comment balloon in Word 2013 and 2016? I have already published a range of posts on issues with comment boxes or comment balloons, including ones on comment boxes suddenly going tiny, or comment box text running in the wrong direction, changing the language in your comment balloons. This article covers how to highlight the text that a comment balloon relates to. Why can’t I see which bit of text this comment balloon is about? How do I highlight the text that’s being commented on? This only applies to your individual view of the document on your particular computer / screen. If your editor, client or co-writer wants to change this view, they’ll have to change it themselves. Send them here to see how it’s done! If you have found this article helpful, please add a comment and/or share it using the buttons below. Thank you! Hello and welcome to an update with one of my new businesses from last year – although these are people I’ve known for around a decade! Julia and Sam run Magical Maths Club Birmingham, and I first interviewed them in the summer last year – we all agreed that September was a much more sensible time to update everyone on how they’re doing. When I interviewed Julia and Sam last year, when they’d only been going a little while, this is what they hoped for for the coming year: “We should be in more schools and have a bigger bank of staff to draw on. We need people who are looking for some casual work, love working with children, enjoy playing games, including games which include some basic maths, and have at least a “C” grade in GCSE mathematics. Personality is very important. We have been very lucky with the staff we have got so far. They are full of life and so enthusiastic. The children love them and it is not difficult to see why. When you contact us in a year’s time, it will be fun to see how much has changed!” Let’s see how they’re getting on! Hello, Sam and Julia! Have things gone as expected and have you achieved those goals you set out last year? When you interviewed us last year we were very new and had just been in a few schools. We had hoped to be in many more schools and indeed we have been! One parent said, “My daughter really enjoyed it. She talked about it all the way home and said she couldn’t wait until next week,” and from one headteacher, “Our children have really enjoyed Magical Maths and I think yours would too! One child asked every day if it was Magical Maths day”. Schools are amazing places with many innovative teachers, making their classes exciting places to be, and they really get what we are offering. It’s fantastic to get this support from teachers. Our main way of working has stayed the same. We offer school assemblies for free, and then the children’s parents sign up for our after school clubs. We now have a bespoke software backend package behind our website to take our orders and although there were some teething problems, especially the week we changed from one system to the other, this is now working well and gives both us and the parents a better experience when booking up online. We have now also been returning to schools for the second and even a third time, with completely new programmes so we have lots of new equipment and resources which means we have had to rethink our storage arrangements. Sometimes the people who say no to you the first time they hear about you turn out to be one of your best customers. Also, the work behind the scenes takes longer than you would imagine, so make sure you allow time for it, but also plan in some breaks!! Reiterating what we said last year – you really do need to love what you are doing!! And it also pays to recruit people who love working for you/in the field in which you are working. We certainly have staff who pull out all the stops to do an excellent job and it makes such a difference. Growing steadily and also offering some options for schools to book us in directly. That’s all very exciting, isn’t it, and well done to Julia and Sam for building their business so well in these first vital couple of years. That’s a great bonus question, too, and one I hope we get some answers to! Best of luck to Magical Maths Club Birmingham and Julia and Sam for the next year! And you can get in touch here if you fancy working for them. They are, of course, on Facebook and Twitter. 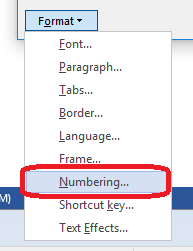 How do I add comment balloon numbering in Word 2013 and Word 2016? I have already published a range of posts on issues with comment boxes or comment balloons, including ones on comment boxes suddenly going tiny, or comment box text running in the wrong direction, changing the language in your comment balloons. 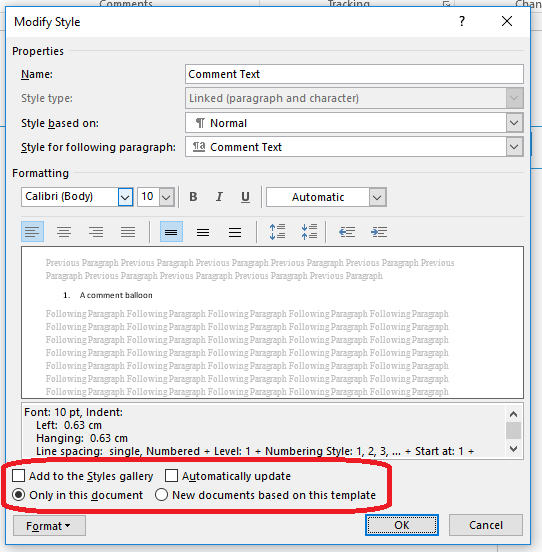 This article covers what to do to add comment balloon numbering back in Word 2013 and 2016. Incidentally, this also signposts you to how to change the style of your comment balloon in general. 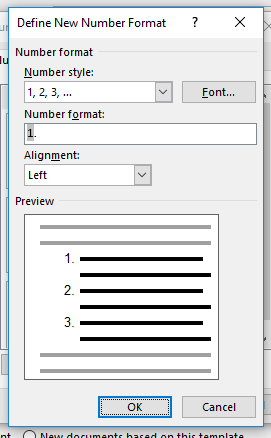 Where have the comment balloon numbers gone in Word? 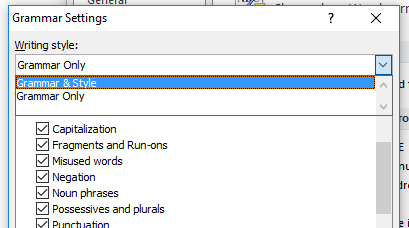 In Word 2013 and 2016, the default setting is for comment balloons not to have numbers. Why? I honestly don’t know. 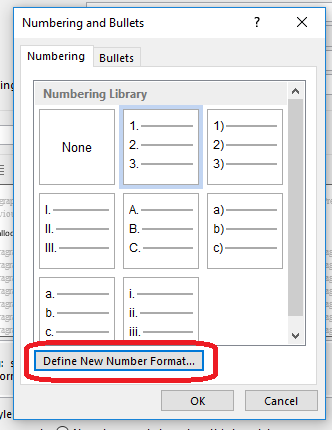 Microsoft does have a habit of “simplifying” its Office interfaces, and the numbers do change with context (if you remove Comment 2, Comment 3 will be labelled Comment 2, etc.) but I have always found it useful to have numbers in my comment balloons. How do I change the comment balloon style and numbering? We need to change the style of the comment balloons in order to add a number. This should be context-specific, but just check the style name is “Comment Text”. Click on the numbering scheme you want to use so that it’s highlighted with a line, and then click OK.
Click OK and your comment boxes will have numbers! 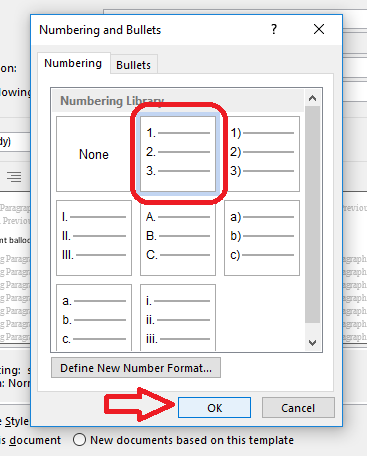 This article has shown you how to add numbers to your comment balloons / boxes / text in MS Word 2013 and 2016 for PC. 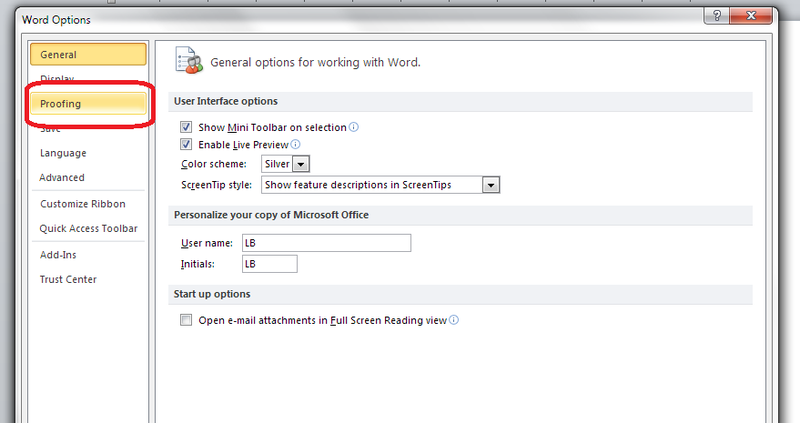 You can use it to modify this setting in earlier versions of Word, but they will default to having numbers. Welcome to another Small Business Update catching up with Chrissie Metcalfe from Chrissie Metcalfe Recruitment. We first met Chrissie in February 2012, and she updated us in April 2013, May 2014 and most recently in June 2015. At that point, she was still working on her own recruitment needs, and trying to get a holiday sorted out, too: “I am currently interviewing for a new member of staff and plans are in place to bring on a fourth member in January/February next year. I didn’t get my car but I do have a beautiful new house, so I would like my convertible this time next year. I have a holiday in Milan planned this year, too …This time next year we will be a four-strong team. Very exciting times!” So, how’s Chrissie doing now? Hello again, Chrissie, and it’s lovely to have you back. Are you where you thought you’d be when you looked forward a year ago? Kind of, LOL. I did go to three members of staff but sadly lost one member as recruitment wasn’t right for her. There are two of us in the business with a new person joining us next month. We have moved office now so we are now a Leeds-based business rather than being based in Pontefract, which has opened up many new opportunities for us. We have a new arm to the business covering events, staffing venues with bar, waiting and kitchen staff, and it’s going really, really well. Helen and I are still working together and we are a very strong team. I look after myself more and take a bit more time off to relax. I wish I had moved to Leeds a long time ago as it is amazing how conversations have now changed when we say we are a Leeds-based Recruitment agency. Taking more time off rather than no time off should have been happening well before this year, as I am now more focused and much more productive. I am also more involved with my accounts rather than letting an accountant tell me what to pay without knowing exactly why. My new accountant is amazing!! In another year’s time the events side of the business will be standalone and I will have a member of staff looking after this full time. I WILL have my convertible. We will still be in Morley and I will be out of the office more bringing business in, as the office will be covered every day. Their website is now at www.cmrecruitment.agency and you can email Chrissie or the general office address. Chrissie@cmrecruitment.agency/info@cmrecruitment.agency. 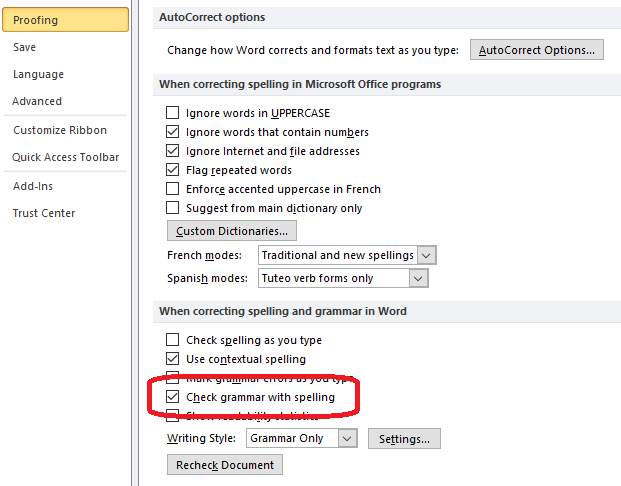 As well as checking your spelling, Word can check your grammar. This is an automated option, so it’s not for everyone, and can be a bit of a blunt instrument, but if you know you have a weakness in a particular area, it can be really helpful. Why does Word check grammar? 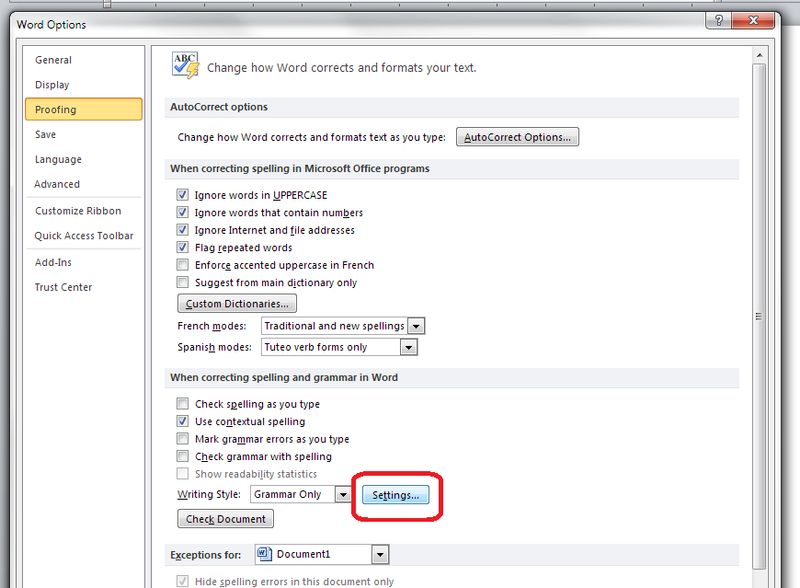 One of the options Word offers is to check your spelling for you, and lots of people are familiar with that option. 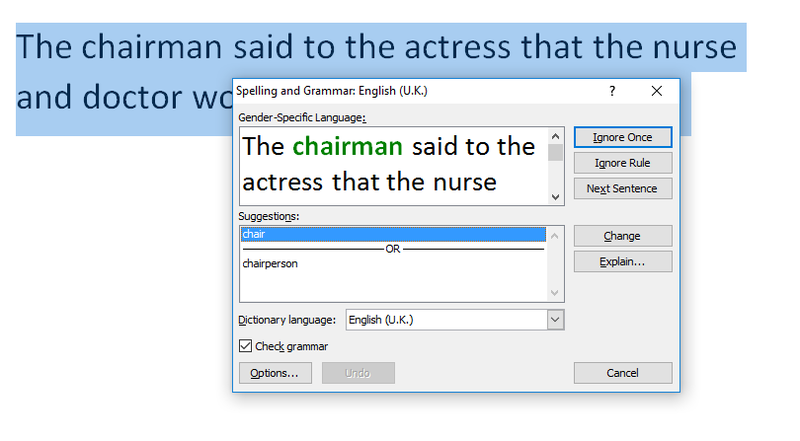 However, you can also ask Word to check your grammar. Here’s how. 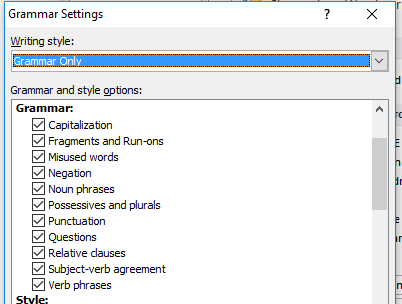 How do I tell Word what grammar options to check? What grammar and style issues can Word check for me? 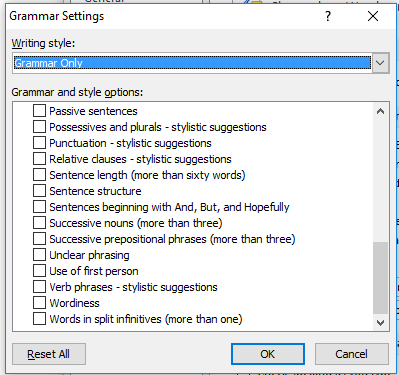 If you have Grammar only clicked, these will all automatically be ticked, and you can untick individual ones if you want to (note that it won’t check anything until you ask it to – see the next section). 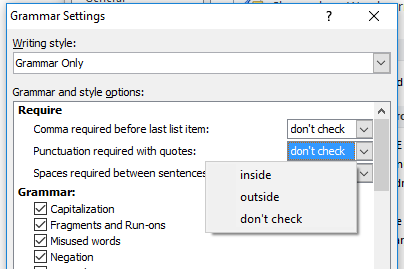 Once you’ve decided what you want Word to check in your grammar and style, press the OK button. 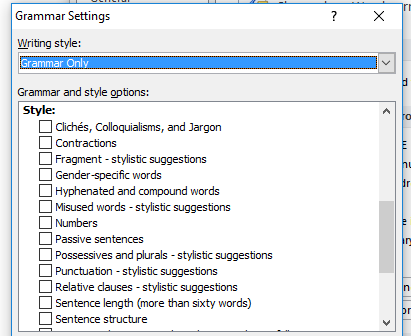 How do I ask Word to check my grammar (and style)? Click OK until you are back at the original screen. 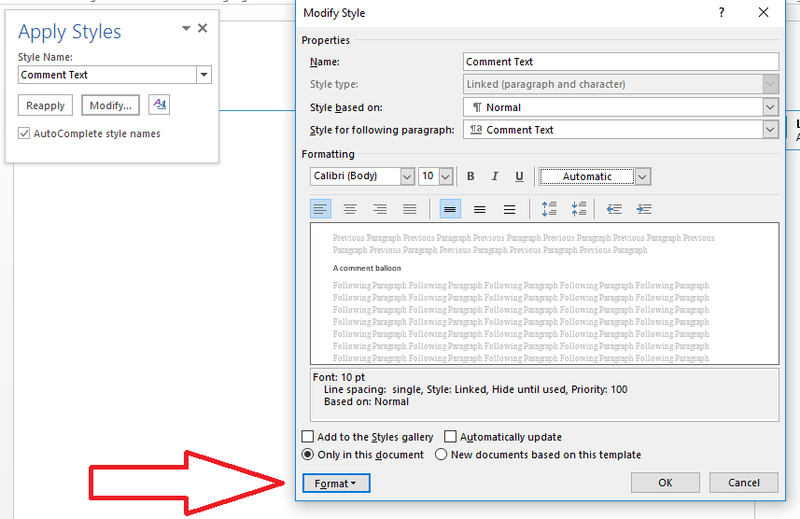 This article has described how to ask Word 2007, 2010, 2013 or 2016 to check the grammar and style in your documents. If you have found this article useful, please share using one of the buttons below. I always welcome comments, too! Hello again, Aled. Sounds like it might have been an interesting year! So, are you where you thought you’d be when you looked forward a year ago? No! Life has gone completely full circle. Following a bitter divorce, I met someone new, moved property 3 times, got married, become a 1st time father and went to Australia to visit family; life has been one HUGE adventure! Despite all of this, business has still grown month on month by approximately 10%. With my new family life, I’m no longer looking to grow the business to franchise it off but to keep it just for the family. There is also the opportunity to return to my Mother Country, which could mean I wind the business down and relocate it in Australia. So this is an option I’m exploring right now. As you’ll gleam from above, very little in my life has stayed the same! Support from family is crucial. The difference in my current life vs previous life is that my new family 100% encourage me to go out there and find the business. In my old life there was support for when things were going well but when times were touch it was a case of ‘when are you going to pack it in?’ That’s not support! Now if I have a concern, I can sit down with family, bounce around a few ideas and listen to their thoughts and encouragement on what direction I should take. So it’s really like having a team! Because of the new-found support, we’re doing more trade business than ever before, we’ve won yet another award for customer service and I’m finding I no longer have time to contact all customers (which I don’t like!) within my own set time scale of 24hrs from their initial email contact. I’m also finding that because of our growing reputation, customers are contacting us and willing to pay our prices rather than trying to knock us down on price. This has led to a small decrease in advertising costs which again helps a small business to grow profit. Get fixed costs from professional suppliers such as accountants. A few years ago I received a fixed cost quote from an accountant to do our books. Because I didn’t re-fix that cost last year the accountant doubled their fee from £900 to £1800 including VAT. That’s a huge increase! So always look to review your fixed costs on an annual basis from professional suppliers, don’t assume they’ll be the same year on year. Because of the above, we’re now using cloud accounting software along with a new accountant that will reduce our accounting costs back down to £900pa. Cloud accounting is a revelation for us in that it cuts down the amount of office paperwork as it’s all cloud based. It makes keeping records so much easier for us that I’m recommending it to all our customers. There are several providers out there and we tried free trial period of a few of them but for us we felt Clearbooks was most appropriate. Other options small business owners might like to look at include Xero and Kashflow to name just a couple. What medium of advertising to you find most useful in obtaining new customers and why? Personally we find Google Adwords most useful but I’ve heard that Facebooks is a massively growing market for successful advertising too… so I’m interested to learn more about advertising mediums and how effective they are for small businesses. Honestly… who knows?! My life is such a whirlwind right now that as mentioned above, our family decides to relocate to Australia. So right now, I guess, to keep all options open for continual month-on-month growth in the UK with the potential to wind it down here and relocate it to another country is what’s most important… only time will tell which way it goes. But one thing is certain… if business keeps growing over the next 12 months as it has done for the last 12 months then I’ll be as financially happy as I am in my personal life right now. Well, that has actually been a rollercoaster of a year (and a bit), hasn’t it! Well done to Aled for getting through all that, and I wonder where he’s going to be next time we speak! I’d love it if people could answer his bonus question – probably because of the repeat nature of my work, I’m in the lucky position of not needing to advertise, so this is a topic I’m not qualified to talk about. And best of luck to Aled and his family for the upcoming year and years! It’s Small Business Chat update time again: today we’re catching up with long-term interviewee Pat Wilkes from gift company Starlight Keepsakes and Gifts, (formerly Starlight Gifts by Pat) who we first met back in June 2013, then in August 2014 and August 2015. This time last year, this was Pat’s plan: “I hope to be another year closer to retiring and being able to use my small business as an income, and I hope to be still supplying shops and doing a few events, as I do enjoy meeting my customers. I hope the business continues to grow and that I keep on learning and it all stays in the black”. Sounds like a good plan to me: let’s see how she got on! Hello again, Pat! So, are you where you thought you’d be when you looked forward a year ago? I think I am happier with where I am now even more so through circumstances, I have changed my job role completely in my day job, and now work just two days which I am loving. This means I have more time to concentrate on what makes me happy which is creating and making. So I may not have to retire as early but continue with a better life balance between needing an income and ploughing time into my small business and having time to enjoy doing other things. That all sounds very positive! What has changed and what has stayed the same? The biggest change is of course more time to spend on the business and I am still coming to terms with limiting myself with working at home its a great temptation to work 12 hour days when I am enjoying what I am doing. So I need to work on this over the next few months as I am still quite new to all this. I have taken part in two exhibitions, which I had never thought about doing before, and also had a piece of my work used to advertise a BBC 4 programme on crafts: this was amazing and has given me the confidence to look at doing this sort of thing again. I will also now have a go at things I had never thought of making before. Some work and some don’t, but I give it a go. What has stayed the same? I still stock a few shops and have spread my wings as far as Wales now, which is lovely, and had one stockist close to another open up, and each shop is slightly different so it gives me chance to make a variety of gifts and keepsakes and not become stale with my designs. I am doing fewer shows and fairs but choose carefully where I go now. I continue to learn all the time and have learnt that it can be a cut-throat business in some respects. Not everyone will think like you, so do your research and look into things before you jump into anything. I have learned that you need to spend just as many hours promoting and getting your work seen as you do making, including getting on social media and building a following. That will help spread the word and you can also make some wonderful new friends who have similar interests. I think the only thing that many of us would like to have known was that we would have to work even harder to make sales with the economy, as it is making a living for the small business has become much harder as customers do not always have the cash to spend and will be more selective. Your products need to stand out and be good quality, so making people aware that what you produce is quality and bespoke and cannot be found on the High Street is a must. Just be prepared to put in the hours and realise it can take years not months to get a business going. Some will grow fast, but slow and sure is the way to go – you stand more chance of being around longer. Make sure what you produce is good quality, and don’t copy others’ work: it’s never a good idea. I would love to know tips on building a following and getting more sales how do they promote their business. Do they find websites work? Or is Social Media the way to go ?? I really hope in a similar position as I am now good work life balance and the business holding its own, still stocking shops and doing the odd event. Of course it would be wonderful to have more sales, as most small businesses must be thinking. Look forward to speaking to you next year. And I’m looking forward to speaking to Pat again next year, too. I love the hints and tips, very good, solid ones for the makers out there. It’s interesting to see what people are doing as the economy doesn’t do so well: I think making people aware of the quality of your work is a must. I personally use my website and blog to promote my business, and also word of mouth: in the early days, I did actually ask people to recommend me to others, although it can be hard to do that, I know! You can visit Pat’s website at www.starlightgiftsbypat.co.uk and view her products, or visit her Instagram and Facebook page. Click to email Pat, too!